Two teenagers try to discover why children in their little town keep disappearing, only to uncover an evil presence lurking in a old mansion that will kill them if they cannot discover its secrets. Trona is a small, smoggy, mostly insigniﬁcant town in California. Besides a booming chemical plant, the only thing that characterizes this dismal town is dirt, sagebrush, and an enormous abandoned mansion. The mansion is, admittedly, the only notable addition to Trona, but it’s something everyone tries to avoid due to its creepy facade. Everyone except for Camm Smith, who is obsessed with the need to get inside. Seven years earlier, as Camm herded a pack of little trick-or-treaters past the mansion, her young neighbor, Hughie, disappeared, becoming one of the many children who have vanished from Trona over the years without a trace. Now a senior in high school, Camm is still haunted by the old tragedy, and is sure the answer to the mysterious disappearances lies hidden somewhere in the decaying mansion. Joining forces with her best friend, Cal, who also happens to be Hughie’s older brother, Camm naively begins a perilous search for the truth. As things spiral quickly out of control, and others die, Camm and Cal discover it will take all their combined ingenuity to stay alive. An unseen evil lurking deep within the bowels of the mansion is now hunting them. To make matters worse, they become entangled with hostile federal agents, who will do all they can to keep old secrets permanently hidden. Add It To Your TBR Shelf NOW! Berk and Andy Washburn, aka "The Brothers Washburn," are both lawyers by profession, writers at heart. They grew up together roaming the wastelands of the Mojave Desert, where most of the series is set. Both brothers returned from lengthy and successful careers in the wastelands of the law to write YA horror stories based on the wastelands of their youth. They currently live north of Denver, Colorado. The Dimensions in Death series is merely the beginning of the ingenious and spine-tingling world of the Brothers Washburn. Be on your guard, people, there is a new Grimm in town. I LOVED this book. There are several scenes (especially Hughie & Ginger) that left me cringing in horror... I honestly thought I wouldn't be able to finish it after that because those issues hit too close to real life. I pushed through them because I needed to know what happened & how it ended. 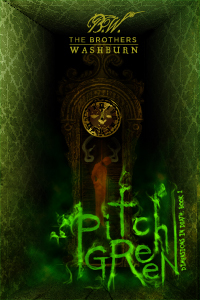 Pitch Green is full of not only horror but a mystery aspect that leaves you glued to the pages. The characters are amazing. They aren't over the top. They're NORMAL - like these people could be my neighbors (if I lived in a creepy little town in the middle of the desert that is). I honestly can't think of one thing that could've been done differently. There are several questions that have left to be answered at the end BUT those are like tid-bits that you are just curious about - not MAJOR things that you must know in order to feel like the story ended. I can't wait to see what The Brothers Washburn come up with next in their Dimensions in Death series. Overall Rating: HUGE 5 Stars! Climax: Which one?!? There were so many moments where I thought my heart would pop out of my chest... but okay, the BIG moment - definitely 4.5 stars! I was chewing my poor fingernails to death!